It is not wrong to say that the iPhone 5S is the best phone that Apple Inc has produced as of date while it is also safe to say that it is the perfect standard of what a smart phone should really be. There are a few competitors that have offered worthy products but for a user that prefers the best when it comes to smart phones, I recommend the iPhone 5. Let us start with the basics. The iPhone 5S is the only device that has been designed and engineered specifically for iOS 7. Apple had introduced devices that run on iOS 7 earlier but however, the iPhone 5S helps users to make use of the iOS 7’s full potential. When considering the design, the iPhone 5S is very similar to the iPhone 5 model but there are some new colour choices, an extra flash as well as a fingerprint scanner. The phone also consists of a superior build quality rather than the common plastic. Also, for the first time, Apple has decided to add a gold colour option while the white and silver colours are similar to the iPhone 5. The gold however is surprisingly stylish since it’s more of a soft champagne tone as opposed to the yellow gold that most people thought it might turn out to be. The finger print scanner or the touch ID as Apple refers to it unlocks the iPhone 5S while it can also be used to make purchases in the app store. The scanner can recognize up to 5 finger prints while setting up the touch ID system is very easy. However, it might not work if your fingers are too moist. 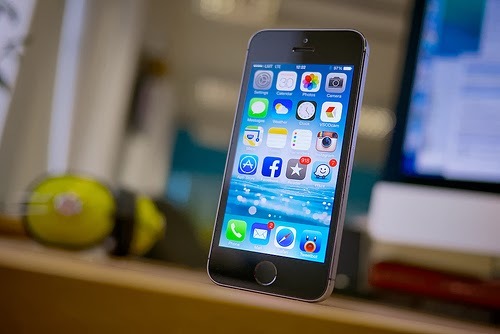 The iPhone 5S is also equipped with a 4” retina display and it is smaller than many high end Android devices. However, the size I think is ideal for many users since you can easily hold on to it and operate it using one hand rather than using both. The display also shows off a natural tone while the device responds instantly to swipes and taps. Thanks to the superb A7 processor, the iPhone 5S is also the fastest iOS device that has been manufactured up to date. The 64 bit processor enables the device to handle the new iOS 7 features. The device also consists of a battery that is larger than the iPhone 5 while the battery life obviously varies according to the way the phone is used as well as the apps that you use. When considering the quality and audio of the iPhone 5S, the phone calls are crisp and clear through the ear piece of the device as well as the speaker and the headset which is included. However, I recommend FaceTime audio calls for the best quality. The iPhone 5S has been blessed with a well improved camera that can shoot 8 mega pixel images. The phone offers clear images especially in low light while there are 2 LED flashes to produce more natural light.